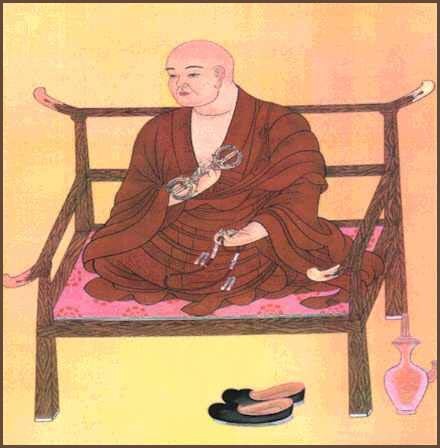 Founder of Shingon 真言 Japanese Esoteric Buddhism. He walked around in many parts of Japan and countless legends about his deeds and accomplishments are handed down. Most ubiquitous are the tales about wells, springs and ponds associated with Kukai. Sometimes he even stopped or destroyed the water supply of an area, if the villagers were not kind to him, the poor monk. Here you find legends related to this pilgrimage and its temples. tokko, dokko, toko, doko 独鈷 / 獨鈷 / とっこ single-pointed Vajra, single-pointed "Thunderbolt"
from Fukushima, Hyogo, Kagawa, Kyoto, Miyagi, Shizuoka, Tokyo.
. tsue 杖と伝説 Legends about the walking staff of Kobo Daishi .
. Amanojaku 天邪鬼 "heavenly evil spirit " - Legends .
. Fudo Myo-O and Namikiri Fudo 波切不動 . How Kobo Daishi found Mount Koyasan　高野山, Wakayama.
. shibugaki 渋柿 and amagaki 甘柿 - bitter and sweet persimmons .
. unagi うなぎ /　鰻 と伝説 Legends about the eel . In the hamlet 柿の木部落 Kakinoki (Persimmon Tree) there were two brothers. THe elder brother believed in 地蔵菩薩 Jizo Bosatsu, the younger one in 青面金剛 Seimem Kongo.
. Taishi-Do 太子堂 Hall and statue with one eye .
. Yamamoto Fudo Son 山本不動尊 - Fukushima . Once a poor farm girl fave all the water there was to a thirsty begging monk (Kukai). And from the next morning, the water from 磐梯山 Mount Bandaisan flew all the way to her village.
. Waterfalls named "Fudo no Taki" 不動の滝 .
. Kukai at 榛名山 Mount Harunayama (1,449 m) . People from the island 淡路島 Awajishima did not give him any water, so he made the wells dry out. 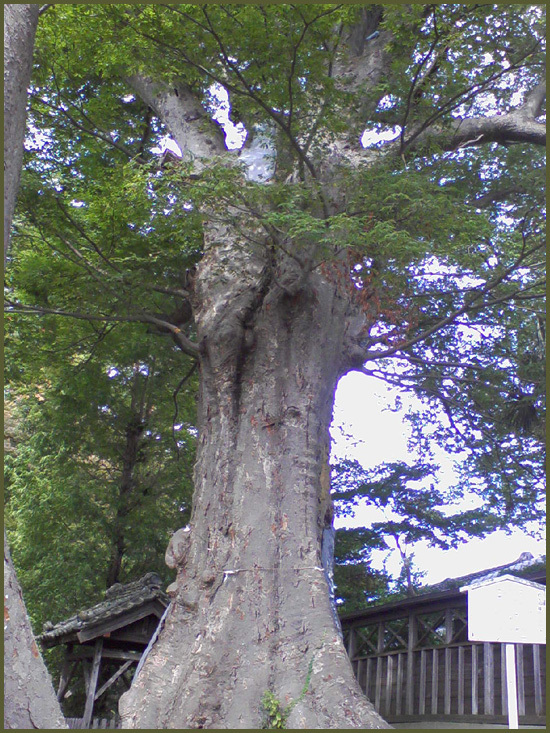 若宮八幡宮の大けやき The Keyaki zelkova tree in the compound of the shrine Wakamiya Hachimangu in Hitachi Ota 常陸太田市. In the village of 能美 Nomi, villagers did not give him any of their precious water to drink. Since then everywhere the villagers dug for water, it had a strong mineral-iron taste. In the village of 下益城 Shimomashiki there was a hot spring pond, but when Kobo Daishi passed here, an old woman lied to him, telling him it was just plain water. From that day on, indeed, the pond turned into a water pond. The mother of Kukai had a vision that a monk had come all the way from Tenjiku 天竺 India and then she got pregnant. 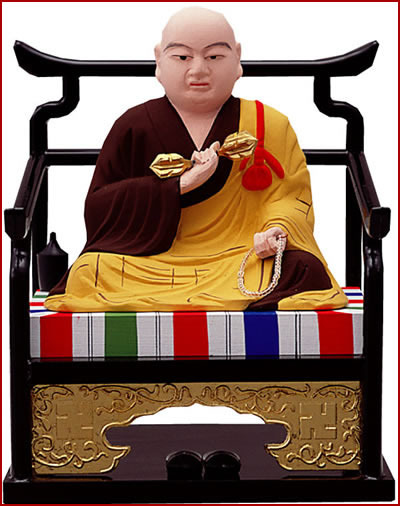 When her son, Kukai, practised the rituals of the Shobo 正法 "True Law", he saw the name of a sutra called 大毘盧遮那成仏神変加持経 Dai Birushana Jobutsu Jinben Kaji Kyoo and eventually got this sutra in China. Back home he had an audience with 嵯峨天皇 Saga Tenno, when his body sent out the five ritual colors of Buddhism and he looked like Birushana Buddha himself. This was his way of showing his human body in eternal bliss (sokushin jobutsu 即身成仏). One legend about shibugaki 渋柿 bitter persimmons, see above. came to a farmhouse at the river 犬飼川 Inukaigawa and asked for some water, but they gave him none. From that time on, the water of the river ceased to flow along there. came to the hamlet 穴太 Ano in 曽我部村 Sokabe village and asked for a cup of water, but they gave him none. From that time on, the water of the river became very dirty. there lived a dirty priest along the fiver Anagawa. Once a woman washed her vegetables further down the river, but just then the dirty priest begun to wash his 手拭 towel. The woman got angry at the priest, but he left without saying a word. Since then, people wonder if this might have been Kobo Daishi. Anyway, since that event, the clear water in the hamlet stopped flowing. At the temple there is a stone memorial of one ken wide and one shaku high (幅１間、長さ１尺). Below it lives a white serpent. This is a 経塚 Sutra Mound founded by Kukai.
. Kobo Daishi and 竜灯 Ryuto, "Dragon Lantern" .